We have just arrived back from our mini break after the wedding and cannot express how delighted we (the bridal couple) and our guests were with your artistry. I cannot even recall the amount of people who complimented your music at the reception, so much so that the co-ordinator had asked for your details to use at his future events. Please extend our heartfelt thanks and appreciation to the ladies for the fantastic experience we had on Saturday. We felt truly privileged to have you play at our special day and expose many of our guests to heavenly sounds. "We wanted to thank you for arranging for the violin and cello duo to travel to join us for our special day. Their music was incredible. It really set the tone of the evening. We hope that they enjoyed themselves too"
"Once again, thank you for the beautiful music provided at our wedding last month. My wife and I will definitely recommend you in the future"
"I just wanted to send a HUGE thank you for your part in arranging for our ceremony music. It was absolutely beautiful and angelic and I had such lovely comments from my guests"
"Your team was awesome on Friday evening. Thank you once again!" ​"Thank you for making our wedding into the fairytale I have always dreamt of. Thank you for playing so beautifully"
"Just an email to thank you for having everybody on time for the wedding at Bakenhof Estate - 5/1/2018 , the quartet and vocalist were well worth it and very professional. Michaela has an absolute beautiful voice, you could hear a pin drop during her performance." 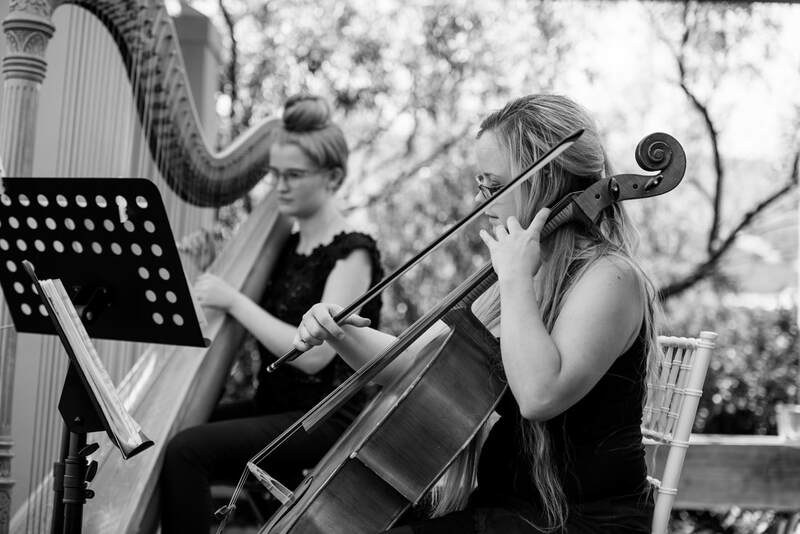 "Dear Louisa, just wanted to tell you that the flute and harp duo did a beautiful job at our wedding/baptism last Saturday and many guests commented on the music. Thank you again." "Thank you so much for playing yesterday at our wedding! It was so nice with the live music and we could listen to you guys the whole day! Thank you for making it something special! With warm regards"
"Hi Louisa, I just wanted to say thank you so much for organising the string trio. They did an amazing with the music and the Rebirth wedding march came out perfectly during the ceremony!" "Dear Louisa and team. Thank you for your beautiful music at our wedding ceremony. We appreciated and loved the beautiful sounds. The bride and groom was ecstatic and what a memory to take back to their country. Thank you for your valued contribution"
"My wife and I would just like to thank you for playing at our wedding, you ladies were just phenomenal!!! The song 'A Thousand Years' which you played whilst my bride walked down the aisle along with the sight of my bride just brought joyful tears to my eyes and to the eyes of my guests too. You were a massive contribution to the beautiful day we experienced and for that we are forever grateful. We will definitely mention your service to people we know who plan to get married"
"You were absolutely perfect! I can't thank you enough for your music, your overall presence which exudes peace and harmony. I am sorry I didn't see you leave, as I would have loved to thank you personally and kiss you goodbye. Your flute added a special touch for me and my sisters, and somehow filled my father's absence, so I am eternally grateful for that." "I just wanted to thank you for your services on Saturday at Lourensford. Your staff were very professional and did a great job. Thanks so much for all your advice and effort. I will recommend you any day"
"Dear Louisa. Please say a big thank you once again to your team for the SUPERB music which you made for us on Saturday during our daughter Christine's wedding ceremony! Best wishes for the rest of the season! And have a wonderful Christmas!" "Hi Louisa. The harpist was perfect!!! It was a little windy on our side of the world, but it was beautiful. The music blended in with the event incredibly well. I unfortunately didn't get her name as I was a little emotional. But I did get to speak to her just before she left. My husband and I would really like to thank both of you for accommodating us on Saturday. It just made a very special day so much better. All the guests commented on how beautiful the harp is :)"